The upside-down flag is a metaphor. This brief history of Wall Street is part of the small-format “Icons of America” series from Yale University Press. Because it’s a good book, you might want to look for others in the line. But nothing on the cover identifies it as part of a series, so if you’re hoping to spot its kin easily at a bookstore or library, you’re out of luck. Wall Street and “Icons of America” are recent examples of trend at university presses to publish more books with mass-market appeal. The older Harvard Business School Press “Ideas With Impact” series is another www.hbsp.harvard.edu. And so far it’s been more successful, partly because it has a distinctive visual identity: You can spot HBSP books from halfway across the store at any airport Borders. Clearly Harvard had an advantage in that the “Ideas With Impact” series gathers articles from the Harvard Business Review, which itself has a distinctive look. But if U. S. News & World Report rated the covers of university-press books the way it rates colleges, Harvard would still win by a mile. Apart from not establishing a brand identity, the cover of Wall Street uses yellowish tones that give it a retro look – a bit misleading given that Fraser carries the history of Wall Street into the 21st century. The cover appears to show a montage of shot-from-below pictures that suggest the dizzying, topsy-turvy action of the markets, partly through the upside-down American flag. It works well as a metaphor. For the same reason, you don’t want to look too long at it. Wall Street was reviewed on Oct. 27 www.oneminutebookreviews.wordpress.com/2008/10/27/. Note: A thousand apologies to anyone who can’t see the image on this post. I’m working to solve technical problems that cause only part of the images to appear to some visitors, particularly those using browners other than Firefox. I’ll repost this page after I’ve fixed this. In the meantime you can see the cover on the Yale University Press site yalepress.yale.edu/yupbooks/book.asp?isbn=9780300117554. Thanks so much for your patience and for visiting One-Minute Book Reviews. Does the Cover of ‘A Long Way’ Gone Show a Soldier in Niger or Another African Country Instead of Sierra Leone? Why Isn’t the Location Identified? Does anything strike you as odd about the photo on the cover of A Long Way Gone, the book that Ishmael Beah bills as a memoir of his years as a child solider in Sierra Leone? For months the picture puzzled me: Why was the young solider wearing a T-shirt in a shade of orange-red so bright, it would make him an easy target for an enemy? The book says only that the picture was taken by Michael Kamber www.kamberphoto.com and came from the Polaris image bank www.polarisimages.com. And at first I suspected that an art director had changed the original color of the T-shirt to a bright orange-red so the cover would stand out more at stores. But the more I looked at the cover, the more questions I had: Why hasn’t the young man’s T-shirt faded when his flip-flops are so tattered? Where was the picture taken? If it shows Sierra Leone, why doesn’t the cover say so? It occurred to me that the soldier might be wearing an orange-red T-shirt for the same nationalistic reasons that the Marines wear their blue, white and red dress uniforms. But the colors of Sierra Leone flag don’t include orange or red – they’re blue, green and white. And the colors of another West African country, Niger, are the colors of the young soldier’s T-shirt and flip-flops – dark orange and green. Soldiers in Niger seized control of the government in 1996 after the ouster of the president Mahamane Ousmane, and Human Rights Watch has called on both government and rebel forces to end abuses against civilians that have occurred in a more recent conflict www.hrw.org/english/docs/2007/12/19/niger17623.htm. Publishers don’t have to tell you more about stock photos than Beah’s book does. Still, wouldn’t you like know how this one found its way onto the cover of A Long Way Gone? You could argue that the cover of A Long Way Gone doesn’t matter, given all the other concerns that have been raised about the credibility of this book by a man who claims to have spent two years as a child soldier in Africa. But book covers always matter in the sense that what you wear on a job interview matters. They’re part of what’s become known in the age of Facebook as “impression management.” So tomorrow One-Minute Book Reviews will consider the cover of A Long Way Gone in the next of its occasional series of posts that rate book covers on their artistry and accuracy in representing the text. You’ll find other posts in the “Book Covers” category at right. This site welcomes comments from booksellers, librarians, graphic designers and others whose perspectives on book covers may differ from those of literary critics. One of the delights of the syndicated Miss Manners etiquette column is that it has always had a distinctive voice – a bit arch and Victorian yet also witty and commonsensical. You would never know it from the covers of some of its companion books. Martin’s advice finds a deft balance between the ideals of two eras – the years before and after the upheavals of the 1960s, which swept away many traditional etiquette rules. You see that trait clearly in the cover of Miss Manners’ Guide for the Turn-of-the-Millennium (Fireside, 1990), which shows of a photo of a fountain pen next to a personal digital assistant. The title floats above them in the John Hancock-ish script that is Martin’s trademark. And the harmonious coexistence of the quasi-archaic font and sleek PDA reflects her style perfectly. You can’t say that for the cover of the more recent Miss Manners’ Basic Training: The Right Thing to Say (Crown, 1998), part of her “Basic Training” series. The regimental stripes seem intended to carry out the mild joke in the title – Martin as a drill sergeant sending you to the boot camp. This is too clever and clashes with her tone. Martin isn’t the John Wayne of etiquette so much as its strict but benevolent headmistress. Worse, the colors of the cover – especially that stop-sign yellow – are shrill, which she isn’t. And on a lunch-hour dash through Borders, who would stop to read a nine-line subtitle in white-on-navy-blue reverse type? Why does a writer with such a steady voice come across on her covers as a teenager who doesn’t know whether she wants to wear a lemon-meringue prom dress or a flak jacket to the party? Well into her career as an author, Martin moved from Simon & Schuster to the Crown imprint of Random House, which gave her a new look. The mismatch may have extended beyond her covers. Martin’s latest book, Miss Manners’ Guide to Excruciatingly Correct Behavior, Freshly Updated, written with Gloria Kamen, was published by Norton www.wwnorton.com. If you’re interested in book covers, check out Rekya’s Bookshelf www.rekya.blogspot.com, a site that focuses book design. It has a great blogroll with links to many good book-design sites and designers’ portfolios. The review of Basic Training: The Right Thing to Say appeared on Nov. 21, 2007, before a second post on Cyber Hymnal that appeared the same day. To read it, click here www.oneminutebookreviews.wordpress.com/2007/11/21/. All cover reviews on this site consider not just aesthetics but how well the cover reflects the contents of the book. That’s why the cover reviews don’t appear until after the review has been posted (or, if I have only a line or two to say, in the section of extra material that follows the review, not in the body of the review). These reviews aren’t just about design but about truth in publishing. The covers of children’s books often fail for the same reasons that the covers of adult books do: They’re dull, clichéd or too pallid to stand out at a bookstore or library. Or they tell you too little about a book or, worse, aggressively misrepresent the contents. And if they’re about people – instead of one of those riveting topics like Let’s Read and Find Out About Flypaper or My First Book About Dandruff – they may stereotype their subjects as nakedly as all those pink covers on novels marketed to women in their 20s and 30s. 1. It has real “pop.” Put Different Like Coco on any bookstore or library shelf and it will stand out among its shelf-mates because of its strong design. It doesn’t need the special effects that make so many books look more like toys – lots of glitter, metallic images and overengineering in the form of punched-out or see-through spaces. 2. The image of Coco Chanel points to the right, or to the pages instead of the spine. This is so basic that no critic should have to mention it. In most cases you want to focus children’s attention where it will encourage them to open a book (though there are some notable exceptions that succeed). But a striking number of picture books ignore such fundamental design principles. 3. The cover represents both the book and its subject accurately and nonstereotypically (without a sea of pink). Chanel designed simple, unfussy clothes with flair. This is a simple, unfussy cover with flair. Matthews’ art reflects the spirit of Chanel’s designs so well that you might guess the subject of her book before you read the title. But the cover isn’t so sophisticated that it will appeal to adults more than children. The comic exaggeration (and that dog) will take care of that. Some people might argue that Chanel’s arms look anorexic. But in the context of the book, the pencil-slim arms are clearly intended as a stylistic exaggeration and also appear on women with bodies of operatic proportions. The only other thing might strike you as odd about this cover is that Matthews’s name appears in a much smaller font than you usually see for authors of her caliber. That’s because this is her first book. The general rule in publishing is: The bigger the author, the larger the font for his or her name relative to the font for the title (though less so for children’s books than others). Stephen King’s name, for example, appears on his covers in a larger font than the title of the book. It’s a safe bet that as Matthews’s reputation increases, the size of her name on the cover will, too. The original review of Different Like Coco appeared on Oct. 21, 2007, www.oneminutebookreviews.wordpress.com/2007/10/21/. You may also want to read a comment in yesterday’s post (Oct. 23) by lisamm, who says perceptive things about this cover, including the Chanel has her head held high. You see hundreds or thousands of book covers — at least in your peripheral vision — every time you enter a bookstore or library, and they probably influence what you pick up and maybe buy or take to the checkout desk. But how much do you really know about why they work or don’t work? 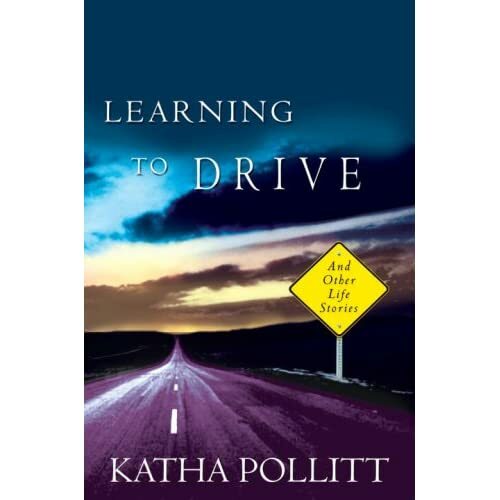 Last week I wrote about why Katha Pollitt’s new essay collection, Learning to Drive, is a good book with a cover that doesn’t serve it well (Oct. 16 and 17). 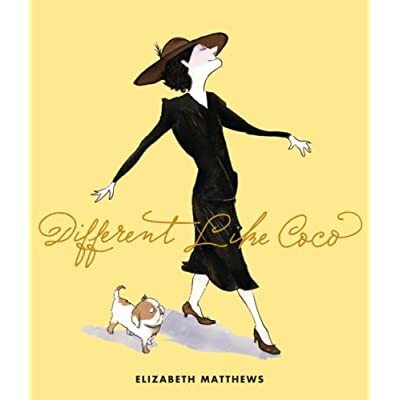 Tomorrow I’ll consider the cover of Elizabeth Matthews’s picture book about Coco Chanel for ages 4 and up, Different Like Coco, which I reviewed on Oct. 21 www.oneminutebookreviews.wordpress.com/2007/10/21/ and also liked. This book is undoubtedly one that the judges for the 2008 Caldecott Medal will look at when they meet to select the winners in January, partly because there are so few good picture-book biographies for children under age 9 that the American Library Association www.ala.org rarely has a chance to honor them. What might the Caldecott committee say? Good cover or bad? Can you give three reasons why the cover works or doesn’t? Check back tomorrow to see if your reasons agree with mine. What was Random House thinking? Katha Pollitt handed the firm a gift-wrapped successor to Nora Ephron’s I Feel Bad About My Neck, the white-hot bestseller from its Knopf imprint, in Learning to Drive. Her book, like Ephron’s, is a stylish essay collection about being a wife, mother, girlfriend, daughter, New Yorker and writer. 1. Visually the design doesn’t “pop,” industry jargon for “jump out at you.” It is way too dark and ambiguous. Except for the road sign, it looks a colorized mammogram. (Just what women want! A book that reminds subliminally them of cancer!) If you lean a few feet back from your computer, you may not even be able to read the title of the book (especially if you’re using laptop like mine, which isn’t brand-new and and has a relatively small screen). It just fades away. And that’s what it will also do at a bookstore or library where it’s surrounded by covers that do pop. 2. The gloomy cover, though a problem, might at least be defensible if reflected the tone of the book – if it appeared on, say, another paranoid Don De Lillo novel. But Learning to Drive teems with life as seen by a woman who is passionately involved with it. It is also entertaining. So where are the women, or even the people? Where is the wit? Yes, the cover shows a road, and the road is a classic symbol of life in literature. So you could argue that, theoretically, it fits the book. But marketing surveys have shown that a cover has 4-to-7 seconds to grab you. In those few seconds, how many people will make the symbolic connection? 3. Above all, the cover of Learning to Drive doesn’t suggest what is unique about the book. Its image of a road could fit anything from Richard Ford’s short stories to Claudia Emerson’s poetry. The cover of I Feel Bad About My Neck showed a jar of skin cream with the title of the book on the label and would have suited no other book. That’s part of what makes it a great cover. I’m not asking for a copy of Ephron’s cover. And I’m certainly not asking for pink. But there’s a middle ground between stereotyping women and denying that a book has anything to do with them. The cover of Learning to Drive renders women invisible, and – oh, irony of ironies! – that is what Pollitt has spent her entire career opposing. Links: Learning to Drive www.randomhouse.com and www.kathapollitt.blogspot.com. I Feel Bad About My Neck www.aaknopf.com. Note: A thousand thanks to Sean Lindsay, the host of the site 101 Reasons to Stop Writing, for a) noticing my comment that I didn’t know how to add images and b) e-mailing me instructions for finding and inserting images. Without Sean, you wouldn’t be looking at the image of Pollitt’s book but reading a description. If you’d like to see a blog by someone who really knows how to pull one together, visit his informative and entertaining 101 Reasons to Stop Writing www.101reasonstostopwriting.com. Why are some books more visually attractive than others? Here’s a partial answer from book designer Carol Goldenberg. ” … book design and typography are at their most successful when not immediately apparent to the reader. It can even be said that book design is a kind of ‘invisible’ art. Carol Goldenberg in The Essential Guide to Children’s Books and Their Creators (Houghton Mifflin, 2002), edited by Anita Silvey, a former editor-in-chief of Horn Book Magazine. The Essential Guide to Children’s Books and Their Creators is an excellent reference book for anyone with a strong interest in children’s literature. As this quote suggests, the encyclopedic text also offers insights into other kinds of books. Design and typography are greatly underestimated partly because, as Goldenberg notes, we often don’t notice them. But they can make or break a book. (This is one reason why you typically see the font identified on the last page.) The best-designed books I have reviewed on One-Minute Book Reviews include Fiona French’s picture books for children, Easter (March 17) and King of Another Country (March 30), and Eric Hodgins’s comic novel Mr. Blandings Builds His Dream House (April 9), which has brilliant illustrations by William Steig. An example of stellar design that I haven’t reviewed here is Nick Bantock’s “Griffin and Sabine” series that takes the form of the correspondence between Griffin Moss, a London card designer, and Sabine Strohem, who lives on a remote island and sends him a notes on his postcards. I chose Chris Costello to do the site for my novels www.janiceharayda.com because he has designed beautiful books, in a great range of styles, for major publishers of titles for children and adults, including Random House and Simon & Schuster. You can see some of his covers by going to www.costelloart.com and clicking on “Typography” and then “Children’s Titles.” Chris has won many awards for his work. What books have you read that are exceptionally well-designed? (c ) 2007 Janice Harayda. All rights reserved.